‘What the heck is coffee cupping’ we hear you cry! As much as we are sure the phrase conjures all sorts of ideas in the heads of many, coffee cupping is a way of tasting coffee in its simplest form. Used by coffee roasters and coffee tasters alike, coffee cupping allows you to taste everything there is within the coffee. The crazy tasting notes on a bag of coffee… most likely came off the cupping table! If you want to cup coffee at home, it is great fun! Grab your mates and family and get started! Small bowls. ‘Official’ sized cupping bowls are available, but if you have some similar in size (to hold 200ml of coffee), then that is great. For a fair cupping session, all of the bowls should be the same size. Some spoons. Again, special cupping spoons are available, but as long as you can get coffee onto it, it will be fine! A deeper, soup style spoon will be super if you have some. Different coffees to try. If you haven’t got any, visit our online shop. Scales are preferred. This way, you will be able to make the cupping a fair test, tasting the differences in the coffee and not in the amount of coffee or water added. Throughout the cupping process, the use of a timer is a must. A timer will allow you to monitor the coffee in the brewing process and to do the same steps at the same point in the process, time and time again. You may find that some flavours will start to come out in time that were not present to start with. To make it more of a fair test, hide any information you have about the coffee which could affect your decision. This could be things such as the origin, altitude, or any information about the flavours of the coffee from the packaging. While the water is boiling, weigh out 13.4g of coffee beans per coffee you want to sample or compare. Grind each of these coffee samples into separate bowls. When we cup our coffees we make sure our coffee has a coarse grind, akin to that of rough sugar. After grinding, smell the coffee to see if you can denote any initial smells. After allowing the kettle to cool for 30/60s, or to 93.5C if you prefer, pour the water over the coffee grounds, making sure all get wet, one bowl at a time. Fill to the top of your bowls. Start a timer when the water hits the coffee in the first sample. After 4 minutes, return to the first bowl and break the crust. To do so, take your spoon and use it like a paddle in the top of the coffee. While sniffing the coffee, push the spoon away from you three times, do the same in all of your samples in the order they were topped with water. Rinsing your spoon in hot water between bowls is the best way to avoid mixing the coffees together. After sniffing, return to the first sample. Using two spoons, scrape the ground coffee off the top of your liquid. Start with both spoons together at the furthest point from you then bring the spoons toward you keeping each toward the side of the bowl until they close together again. Discard these grounds. Repeat over all of your samples. After 12 minutes in total, the coffee cupping can commence. Smell the aroma again. Pop your spoon gently into the coffee as not to disturb any grounds that have settled and slurp off the spoon. The louder the slurp, the better! The method into this embarrassing noise is to allow the coffee to coat all of your mouth, awakening all of the senses. As the coffee starts to cool, taste the coffees again and again. Different flavours and textures will most likely be masked by the initial heat of the coffee. All together this process will take around 20 minutes. Write notes on what you can smell and taste and then discuss with your peers. When making notes, there is never a wrong answer. Everyone is different and their experiences throughout life will make smells and tastes remind them of something, whilst it may remind someone else of something else. For ideas about flavours and smells, see the SCAA cuppers wheel on our jargon buster. 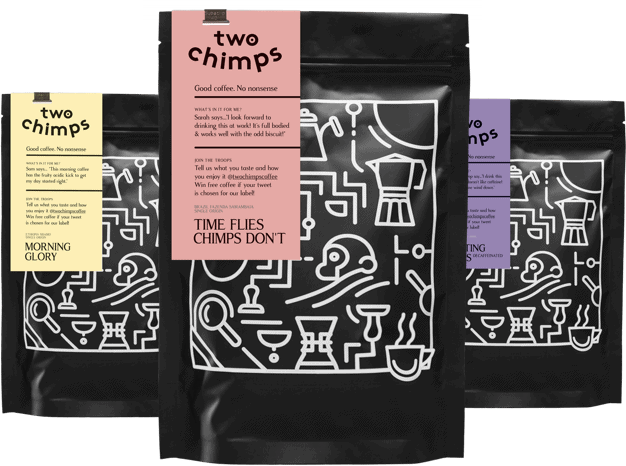 And there we have it- the Two Chimps guide to coffee cupping!